I call my French toast Pan Purdue when it’s as delicious as the Pan Purdue at Lucille’s. Especially when I am also drinking the hickory coffee that my loving father sent me from Cafe du Monde. It was all very Creole. Dave doesn’t like chicory coffee, so this all obviously took place when Dave and Luke were in Crested Butte for Fat Bike Worlds. Jack and I treated ourselves (I treated Jack) to a couple yummy breakfasts. I made this bread the night before from the new cookbook that my sister in law got me for my birthday: Flour Water Salt Yeast. (Thanks Suzanne!). Then I haphazardly threw together eggs, milk, vanilla, brown sugar, cinnamon, and nutmeg. As I was making the egg mixture I was imagining teaching my grandkids how to make French toast, (can’t get my kids interested so I am biding my time) and I imagined myself saying, “Just a hint of nutmeg, it’s the secret ingredient.” But I was paying more attention to my imaginary, loving and attentive grandchildren then to what I was doing and I put more than a hint of nutmeg in. I opened the wrong side of the spice jar, and let’s just go ahead and call it a teaspoon. Maybe two. Regardless, the French toast was delicious. We had the Pan Purdue on Saturday, and not just because Friday’s breakfast was less than photo perfect. Friday, I made oatmeal blueberry pancakes. I made a full recipe, and Jack ate everything except these two burnt pancakes. That’s all that was left for me. I need to perfect the recipe before I share, but it’s basically oats, whole wheat flour, and then the usual. I’m so glad I made it when it was just Jack and I because… it doesn’t make that many. They are very hearty, but Jack still said they tasted like an oatmeal cookie. They would probably be good leftover too, but I may never know. This entry was posted in food and tagged french toast, pan purdue, pancakes on February 2, 2018 by metamegan. I doubled the recipe, and I went with 2 teaspoons of baking soda and 4 eggs. Since I had the extra liquid from the eggs I added about a cup of oats. They were good! I put blueberries in some, chocolate chips in others, and I put some toppings out for people who wanted more of one or the other. I think Jack ate all the chocolate chips before the other half of the family was up. I served the pancakes with fruit, syrup, and sausage. There really wasn’t enough, everyone had to FHB. (Family hold back.) But it was a long and lazy morning with plenty of opportunity to have other food to go with it. I wish we could spend more Saturdays like that! I miss that sweet baby and her parents. This entry was posted in food and tagged breakfast, pancakes on August 11, 2017 by metamegan. I’ve made these pancakes for Fancy Breakfast Friday before, but I never shared the recipe. The reason I made something as standard and boring as pancakes is that I have had an ongoing buttermilk situation. I know I have complained about King Soopers before but here I go again. They have goat, soy, almond, cow, banana, chocolate, coconut, cashew and probably more types of milk. But last time I looked for buttermilk they didn’t have any. The dairy guy said, “You know, you can just add a splash of lemon or vinegar…” And I said, “I KNOW! I’m the queen of making fake buttermilk. But when I plan ahead and I’m at the store, it’s because I want ACTUAL buttermilk.” But I said it very nicely. Add all dry ingredients to a bowl and mix with a fork. Measure the milk in a measuring cup that is larger than the amount of milk you are using. Crack the egg into the measuring cup and stir well with a fork. Add the wet ingredients to the dry ingredients and stir with the fork until just mixed. Allow to rest for a second while you heat the griddle. I make these pancakes in a smiley face skillet. Using a ladle I fill each face with batter and put a spoon full of frozen blueberries on top. When the edges look cooked and bubbles are rising I flip the pancake onto another heated skillet. There is no way I could accurately flip the pancakes onto the faces in the skillet. So my smiley pancakes are one sided. This actually makes it go a lot faster since I have two skillets cooking pancakes at once. My other pancake secret is that I keep them warm on a plate in the microwave. This is great in the summer when you want warm pancakes, but you don’t want the oven heating up the house. This is a trick I learned from Dave. These pancakes were loved by all, and eaten all weekend, sometimes as a pancake and peanut butter sandwich. Sometimes toasted. Sometimes just at room temperature like a piece of delicious bread. If you are looking for a trip down memory lane, please feel free to read this description of Luke’s first day of kindergarten. It came up when I was searching my blog for “pancake”. This entry was posted in food and tagged breakfast, pancake, pancakes on November 3, 2016 by metamegan. I chased that cornmeal and blueberry dream combo one more time and at last I found the perfect recipe. (Note – I gave up on the lemon aspect. See other attempts here.) But these pancakes were very good. Easy to make, I had everything on hand, they were delicious and everyone liked them. I have also been very interesting in recipes that don’t require an oven, because it has been as hot as the surface of the sun lately and we don’t have air conditioning. These pancakes are based on the cookbook Feed Zone Portables which I have been using a lot lately! (Waffles, baked eggs, and frittata) I highly recommend this book for homemade snacks you can eat at school or for breakfast or on runs/bike rides/hikes if you want to avoid a prepackaged bar and you are not a fan of peanut butter and jelly. I just defrosted the blueberries and then mixed in the sugar and let it sit while I made the pancakes. Pretty easy. Measure the milk in a glass measuring cup and heat for 30 seconds in the microwave. Crack the egg into the measuring cup and stir well with a fork. Melt the butter in the microwave (make sure it isn’t too hot, you don’t want to cook the egg.) and add to the egg and milk. Stir well with the fork. Add the wet ingredients to the dry ingredients and stir with the fork until just mixed. Allow to rest for a second while you heat the griddle. It may seem a little runny. I make these pancakes in a cast iron skillet, adding a little butter occasionally to get that yummy pancake look on top. Ladle about a 1/4 a cup of batter for each pancake onto the skillet, flipping when you see a lot of bubbles and the sides look a little cooked. Serve with blueberry syrup, but offer maple syrup for weirdos who don’t like blueberries. This entry was posted in food and tagged breakfast, pancakes, skratch on July 29, 2016 by metamegan. Simply Colorado is a cookbook I received at my wedding shower, 18 years ago. It appears to be available on amazon for $0.01 at this time, which is a steal. My go-to pancake recipe is from this book, and I love it because it uses 100% whole wheat, but the pancakes are still very light and fluffy. It calls for blueberries, which I usually have in the freezer, and buttermilk, which I rarely have on hand. When I do have buttermilk, I make these pancakes and they are amazing. When I don’t have buttermilk, I add a splash of white vinegar to regular milk and let it sit for a minute. 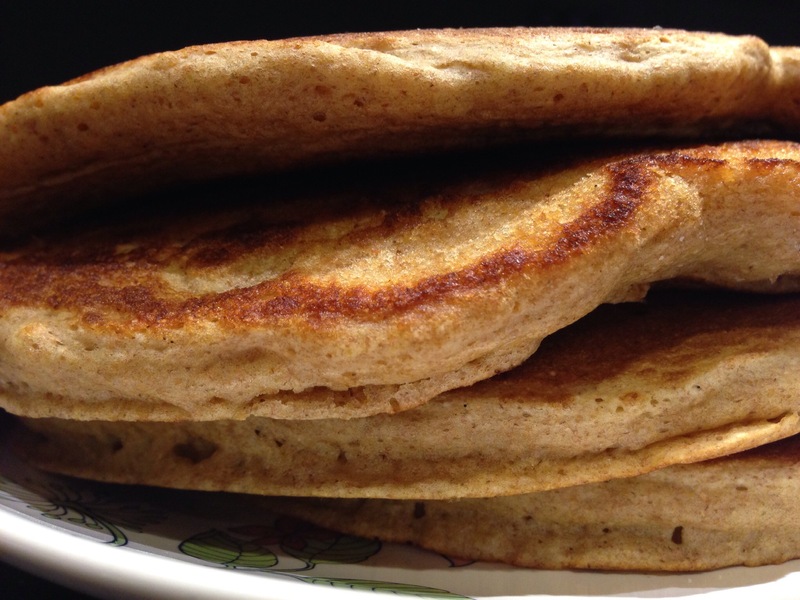 This entry was posted in food and tagged breakfast, pancakes on September 18, 2015 by metamegan.